By the way ... in 2006, a trainer at the adventure park was hospitalized after a killer whale grabbed him and twice held him underwater during a show at Shamu Stadium. In 1999, Tillikum (the same whale that killed the trainer today) was blamed for the death of a 27-year-old man whose body was found floating on his back in a tank at SeaWorld. 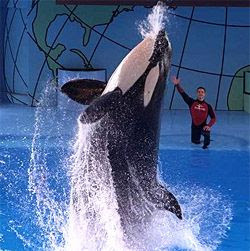 Tillikum and two other whales also were involved in the drowning of a trainer at a Victoria, British Columbia, marine park in 1991. Sea World came up with the answer ... the whale shows have been cancelled temporarily. "The guy gave the girl teacher a lap dance," a student told the Sun. "It was dirty. He put his face in her crotch. She laughed and looked like she was really enjoying it." Thursday morning, CNN reported this story from a New York news station affiliate.The 141 year old hot dog was found by an archaeologist under Feltman's Restaurant and was encased in ice. The video of the story from the local TV news station showed an original receipt from Feltman’s that was encased in the ice as well. The reporter went on to say that the hot dog was being put on exhibit and they were touting it as the first hot dog in existence. The exhibit was scheduled to open on Coney Island on Palm Sunday. The news story even went so far as to ask people if they would go out to Coney Island to see the hot dog exhibit and many people said they would. 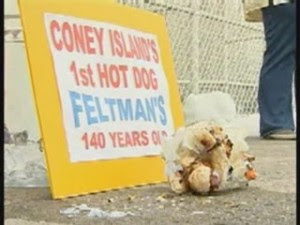 As it turns out the WHOLE STORY was a publicity hoax to get people to go out to Coney Island. CNN removed the story and video from their website without explanation. SO WHAT WERE THEY THINKING??? ?